In this guest post, Ralph Montague (Managing Partner of ArcDox, a BIM consultancy practice based in Dublin, Ireland) offers his insights into the changing role of the project manager in the UK following the Government’s BIM requirements and rapidly-changing market landscape. I’m sure you’ll find his insights very useful (editor). In 2011, the UK Government implemented an ambitious construction strategy intended to reduce construction cost and waste; improve the quality and performance of buildings; reduce carbon emissions; improve the competitiveness of the UK construction industry in a global market; and drive economic growth in the sector. With a clear vision and Task Group leadership, they set out to implement this strategy from the cabinet office down through all government departments. Part of this strategy was to make Building Information Modelling (BIM), an information production and management process, mandatory on Government’s projects by 2016. To implement this strategy and mandate, the Government supported the development of standards and protocols that would enable BIM processes. This approach resulted in significant BIM-related discussions and developments. From among all these discussions and chatter, it is important to isolate the BIM issues that are important to project directors, leaders, and managers. It is also important to identify the project manager’s BIM role. BIM is discussed across numerous documents with lots of terms and acronyms. Many of these can sound overly technical, complicated and overwhelming. This article will hopefully provide project managers with some clarity and identify the documents that facilitate managing BIM projects more effectively. After a brief introduction, the post will provide five basic questions that each project manager will need to ask the project team, and then ensure proper responses are received. At the end of the post, a checklist is provided for project managers to use during project meetings and team workshops. To the uninitiated, BIM can seem both complicated and overwhelming. This is typically because we, as an industry, are attempting to do something quite novel; bring together a diverse range of professionals, consultants, contractors and sub-contractors; encourage them to work together in a collaborative and coordinated way; ask them to use new industry standards; and adopt innovative digital workflows. However, although these changes may appear overwhelming, at its essence, it is simply about improving the way we currently work. Even if it takes some initial additional effort to adopt all these changes, there are significant improvements to be gained in design coordination, construction quality, and information accuracy. As demonstrated in the UK government BIM pilot projects (refer to www.bimtaskgroup.org), there are measureable reductions in construction waste as well as time-savings across the construction programme. Better information flows through digital transfers, reduced duplication of effort, etc. Better information capture, storage and sharing across project stages, particularly for ‘handover’ from design to construction, and from construction to operation. It is important to remember that the benefits of BIM cannot be fully realized without a clearly defined and well managed BIM processes which project participants are required to adhere throughout the project. Without such processes, the use of BIM on a project may cause unnecessary costs and delays. This is where a well-informed project manager, armed with knowledge and experience in industry protocols and standards, will shine! To ensure the implementation of BIM has a positive impact on the project programme, cost and outcomes, a project manager needs to ensure that (a) clearly defined and well managed BIM processes are in place; and (b) check that every project participant will be making the necessary contributions into the project. As part of its BIM mandate, the UK Government has supported the development of a suite of documents and standards that would support widespread BIM implementation (Figure 1). BS1192, the British Standard for managing the production, distribution and quality of construction information, has been extended to include four additional Publically Available Specifications (PAS). These are PAS1192:2 specifies requirements for achieving building information modelling (BIM) Level 2 during capital delivery phase, PAS1192:3 specifies information management for the operational phase of assets using BIM, PAS1192:4 specifies employers’ information exchange requirements using COBie, and PAS1192:5 specifies security-related matters for BIM and smart asset management. 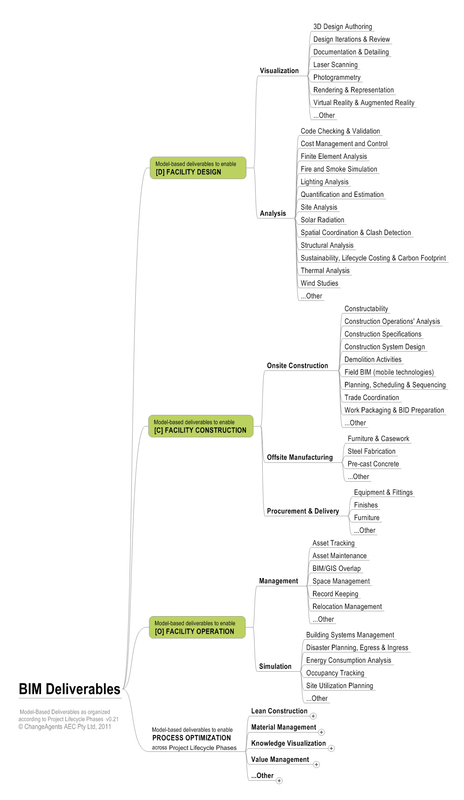 Obviously all these parts are important, but from a project manager’s perspective, PAS1192:2 is the key document. Figure 1. PAS1192- Level 2 BIM Process Protocols and Standards. To achieve success across BIM projects, project managers need to ask the right questions and ensure key standards are implemented in a timely fashion. While the responsibility for dealing with these questions can be delegated to other parties – e.g. the legal team, commercial contracts team, consultants, contractor, and sub-contractors, it is the project manager’s role to ensure they are properly answered. Question 1: is all required BIM documentation - as set out in PAS1192:2 – in place? Question 2: are all participants aware of the BIM-related requirements for producing, managing, and exchanging project information? Question 3: is all project information being generated, managed, exchanged using the right BIM-suitable formats? Question 4: is the federated model being used and shared at design coordination and stakeholder meetings? Question 5: is the information content within models being regularly checked for compliance with employers’ information requirements? Is all required BIM documentation - as set out in PAS1192:2 – in place? Have Pre-qualification Questionnaires (PQQ)s covering BIM capability been included in tender requests for both design and construction services? Have all appointed designers/contractors agreed and signed the BIM Protocol (as an addendum to their appointment/ contract)? Is an Employers Information Requirements (EIR) provided as part of tender requirements? Note that the EIR is a document setting out the client’s BIM objectives and deliverables, including a preliminary Model Information Delivery Plan (MIDP). Have all tendering designers/contractors provided a Pre-Contract BIM Execution Plan (BEP) as part of their tender submission, in response to the EIR? Has the lead designer signed up to the role of Project Information Manager (Design Stage)? Has the main contractor signed up the role of Project Information Manager (Construction Stage)? Have all parties - involved in design - informed their PI insurance brokers that they are participating in a BIM project? Has the Project Information Manager (for both the design and construction stages) provided a coordinated Post-Contract BIM Execution Plan (BEP), detailing how the team will deliver the Employers Information Requirements (EIR)? Is there a Common Data Environment (CDE) in place for the design and construction stages, in compliance with PAS1192:2, and acting as a central repository for all project information (graphical and non-graphical)? Requirements need to be specified within the tender documents to outline who will provide the CDE, and what features/functions the CDE needs to include. Note: BS1192 & PAS1192-2 are currently being considered as a base for ISO 19650, and may well become international best-practice in the future. Are all participants aware of the BIM-related requirements for producing, managing, and exchanging project information? According to UK Level 2 BIM documentation, each discipline need to generate, manage and exchange their project information in a digital format. This requirement must be clearly communicated, highlighted and accounted for in tender prices. Such digitisation is important in order for different work elements to be federated into an overall coordination model for review and eventual handover to the client. Where documentation has not been derived from models, it needs to be clearly highlighted and agreed upon. By requiring every participant to provide their pre-contract BEP and BIM capability assessment, and participate in preparing the post-contract BEP, we can be certain that each member of the project team is aware of their respective role and responsibility. Is all project information being generated, managed, exchanged using the right BIM-suitable formats? The project manager needs to ensure there is no pseudo-BIM being provided or BIM wash being committed. If team members are not generating their information in a BIM-suitable digital format, it is imperative to ask them to justify that and – if no valid reason is given – request they provide it as soon as possible. It may be reasonable that some work elements do not require the use of BIM tools and workflows, and that this may change at later stages of the project. This is perfectly acceptable if this is documented and agreed upon by the project team, and if duplication and additional costs are avoided. This is why the Master Information Delivery Plan (MIDP) is an important document to complete as it details the building elements that need to be modelled, at what stage, by whom, and at what Level of Definition (Level of Model Detail and Level of Model Information). This would provide clarity and transparency and manage team expectations. Is the federated model being used and shared at design coordination and stakeholder meetings? The project team should use federated models through a Model Viewer to facilitate communication and information sharing at every meeting. The use of these federated models allow enhanced visualizations and understanding, and can facilitate better analysis and multiple Model Uses such as Clash Detection; programme analysis and sequencing (4D); cost analysis and quantity take-off (5D); Structural Analysis; Energy Use; Lighting Analysis; Egress and Ingress analysis; Safety Simulation; quality control/snagging; Commissioning; operational cost; Life Cycle Assessment; and multiple uses in FM/operations. That is, if the project team are investing their efforts in creating models and populating them with information, it makes sense to leverage these models to benefit the project and better inform the project team. Is the information content within models being regularly checked for compliance with employers’ information requirements? Completeness by assessing information against object properties/attributes expected at the completion of each project stage (as detailed in the EIR/MIDP). Facilitate workshops and induction meetings until information management roles are well established. Project managers play a vital role in a project’s programme and outcomes. With the wide-spread adoption of BIM, digital Information Management has become a key part of that role. That is, project programme and outcomes are now – more than ever – directly impacted by the quality and timeliness of information generated and shared by all project participants. Receiving the correct information, at the right time, and in a usable format is critical for decision makers to keep each project moving in the right direction, and to avoid decision reversals, wasteful delays, and abortive work. While project managers do not generate 3D models themselves, it is important they understand all critical BIM-related technologies, workflows and protocols, so they can adequately manage the BIM process and achieve successful project outcomes. While the use of BIM on projects can yield great benefits to project stakeholders, these won’t be achieved without a clear plan, the right technologies, a committed project team, and – most importantly – a well-informed project manager. Ralph Montague is managing partner of ArcDox, a specialist BIM consultancy practice based in Dublin, Ireland. ArcDox (www.arcdox.com) provides professionally-managed advice, production, support, and training services to the construction industry. Ralph is an architect with extensive experience in managing large projects. Since 2009, Ralph played a leading role in the adoption of BIM in Ireland. He is currently the Chairman of the RIAI Practice Committee for BIM, and the Coordinator of the Construction IT Alliance (CITA) BIM Group. Ralph is also a part-time lecturer (BIM and Technology in Construction) in the Project Management programme at Trinity College, Dublin. A collaborative BIM project is not a simple undertaking. This is especially true if the project in question is a large facility (e.g. a high-rise building or a major hospital), the project participants lack the necessary experience, or the BIM requirements are not clearly defined. This episode will discuss three main criteria for the primary consultant, the project manager or the independent facilitator to consider when initiating a collaborative, model-based process. To satisfy the second criterion, the BIM capability of service providers  must match the Client’s defined goals. For example, if the Client (aka Owner) requires the delivery of a coordinated as-built model to tie into a facility management/maintenance system, then the relevant project participant must have that ability. If the Client expects the model to be used for offsite manufacturing (e.g. precast panelling or steel detailing), then the relevant project participant must be able  to deliver exactly that. Any mismatch between the Client’s BIM requirements and the BIM abilities of service providers is a gross inefficiency - an unnecessary cost incurred by the Client. Even when the BIM goals are well-defined and the project participants are individually competent, a third criterion needs to be satisfied – common objectives and workflows. That is, for a Large Collaborative  BIM Project (LCBP) to be successfully initiated, the project team must be willing to communicate, to share risk, to modify processes, and to exchange knowledge. The project team must also know/learn how to work together: what to model (or not to model), what to exchange (or not to exchange) and when to exchange it. Reaching a common understanding of the most efficient modelling/sharing tools, processes and protocols is critical and cannot be overstated. This common understanding can be ad-hoc (issues resolved as they arise) or well-planned, executed and monitored. It goes without saying that a planned approach can be infinitely more efficient than ad-hoc practices especially if collaboration workflows are clearly mapped, reasonably comprehensive and well-tested. The workflow pool above  depicts what a BIM Facilitator  may use to initiate a model-based collaboration effort. The workflow is subdivided into three lanes  and includes a set of events, tasks, data objects/stores, and gateways which describe a logical progression to clarify Client Goals, Establish BIM Competencies and Define Common Objectives and Workflows. While tasks (rounded rectangles) describe the main activities expected from the collaborating team, data objects linked to these tasks hold an extensive set of information which are either requirements (input objects) or deliverables (output objects). These data objects can take the form of guides, manuals, checklists or any other type of structured information that facilitates the sharing of knowledge and the exchange of data. Workflows like the one depicted above vary according to organizational, contractual and market-specific conditions. However, they can be instrumental - even if generic and incomplete  - in clarifying objectives, defining incremental steps and, more generally, increasing the efficiency of a collaborative BIM project at its first and most critical phase. LCBPs are, by definition, complex undertakings. This complexity must be reduced significantly if the benefits of BIM are to be maximized . One excellent way of reducing complexity is through simplified diagrams, mind maps and visual workflows. Using a structured language (like BPMN) has its advantages; however, any type of clear graphical representation will do. Finally, initiating large collaborative BIM projects can be excessively demanding with the absence of goal clarity, participant competency and agreed know-how. Clarifying the Client’s goals as early as possible, assessing/aligning the BIM competency of project participants, and the utilization/development of clear workflow plans can significantly reduce project complexity and increase its efficiency. The term Service Providers refers to architects, engineers, builders/contractors and sub-subcontractors while the term Project Participants refers to a wider set of BIM players including the client/owner, operator and project manager. To ensure that BIM service providers can actually deliver what they promise to deliver, a capability/maturity assessment is highly recommended (refer to BIM Episodes 11, 12 and 13). 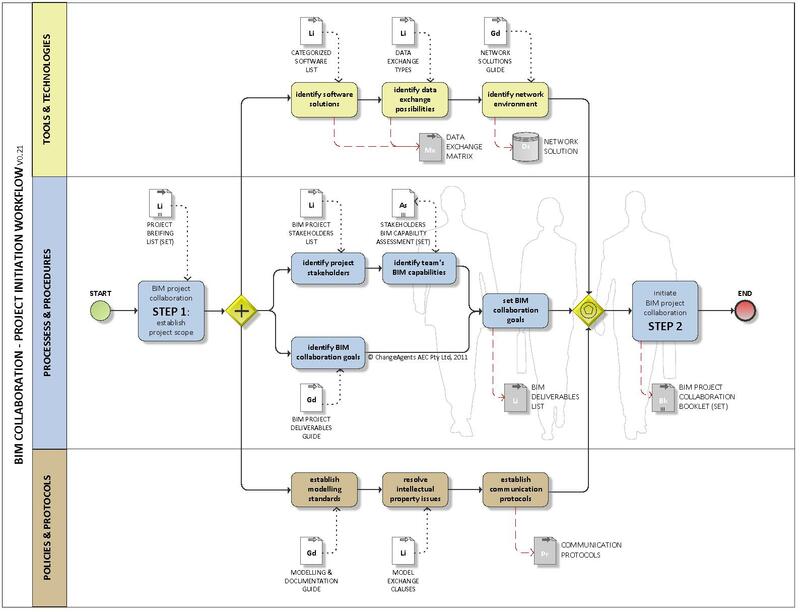 This visual workflow is based on Business Process Modelling Notation (BPMN) – a structured language suitable for process management and automation (Wikipedia link). A BIM Facilitator is a term describing a new emerging role different to that of the Model Manager. BIM Facilitators can either be internal champions or external advisors. A separate, future post will be dedicated to BIM Facilitation. This workflow is depicted at high-level and can be subdivided into different pools and additional lanes to suit project roles as appropriate. The BIMe Initiative is not-for-profit effort based on the BIM Excellence approach. The BIMe Initiative aims to improve the performance of individuals, organisations and project teams in the construction industry through (a) developing a modular language for information exchange; (b) Generating reliable industry-wide competency benchmarks; (c) promoting competency-based learning; and (e) developing intuitive tools and templates for all to freely use. The BIM Dictionary, an online resource for all to freely use. The dictionary hosts terms specific to digital transformation in the construction industry. It hosts hundreds of terms with their descriptions, synonyms and abbreviations. BIM ThinkSpace is one of the longest running blogs (first post was in Oct 2005) covering Building Information Modelling from an 'informed practitioners' perspective. It posts infrequently yet shares thought-provoking topics and valuable contributions from international guest authors. A blog for researchers interested in adapting the BIM Framework (Succar, 2009). Each post focuses on one conceptual part and is linked to peer-reviewed papers. BIM Excellence (BIMe) is a research-based method to improve the BIM competency of individuals, organizations and project teams. BIMe uses specialised online tools to compare current abilities against project/client requirements and industry benchmarks. ChangeAgents AEC is a BIM performance assessment and improvement consultancy operating since 2004 out of Melbourne, Australia.